Tanzuowan village, located in Jiangxia district, Wuhan, central China's Hubei province, seems like just another of the country's numerous villages. Except that, instead of getting together for poker or Mahjong during the slack season, the residents of Tanzuowan gather to sing the songs of Peking Opera. While a century-old tradition, it was hardly known outside the village until the arrival last month of descendants of Peking Opera master Tan Xinpei (1847-1917). A native of Tanzuowan, he was the inspiration for the character Shisanyan in the much acclaimed Chen Kaige movie, Forever Enthralled. 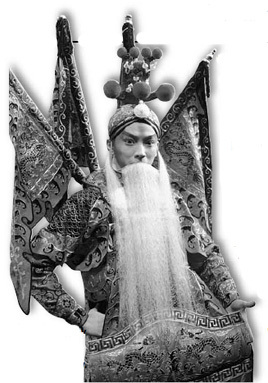 In a career spanning more than half-a-century, Tan established and developed the role of laosheng (old male) in Peking Opera. His voice was characterized by a perfect combination of strength and gentleness. He formed his own company to popularize a new performing style which combined singing, speaking, acting and martial arts. This new approach came to be known as the "Tan School", and had a far-reaching influence. Even today, most of the lao sheng styles are based on this approach. His descendants have kept alive the enthusiasm for Peking Opera that has, unusually for China's operas, already lasted seven generations. Tan's fifth son, Tan Xiaopei, and grandson, Tan Fuying, were also renowned laosheng actors. His great-grandson, Tan Yuanshou, is now a veteran performer of such roles. His son Tan Xiaozeng, the sixth generation of descendants of Tan Xinpei, is currently China's best laosheng actor. Tan Yuanshou's grandson, 30-year-old Tan Zhengyan, has already won the national top Peking Opera competitions for young people. "The Tan family made great contributions to the development of Peking Opera, and in some sense, the history of the Tan family can be seen as the history of Peking Opera for the past more than 150 years," says Hu Hanning, an opera expert of Hubei province. Tan Xinpei left his hometown when he was only 6 and never found the chance to return. This remained his biggest regret and he instructed his children to go back to his hometown. They never forgot his last wish and always hoped that one day they would go back to Wuhan and stage a big performance. This dream finally came true on May 22. Eighty-one-year-old Tan Yuanshou - Tan Xinpei's great-grandson - accompanied by his son Tan Xiaozeng and grandson Tan Zhengyan paid a visit to their hometown. Upon seeing the old house where Tan Xinpei once lived, an excited Tan Yuanshou exclaimed: "After more than 100 years, the descendants of Tan are back!" Wuhan residents got the chance to see rare national top Peking Opera galas, featuring more than 30 descendants of Tan Xinpei and other top Peking Opera artists.